France has deployed thousands of security forces to the capital Paris ahead of new round of massive “yellow vest” protests. The protest organizers said thousands of people are set to take to the streets in Paris on Saturday, and that the protests will continue until all their demands are met. 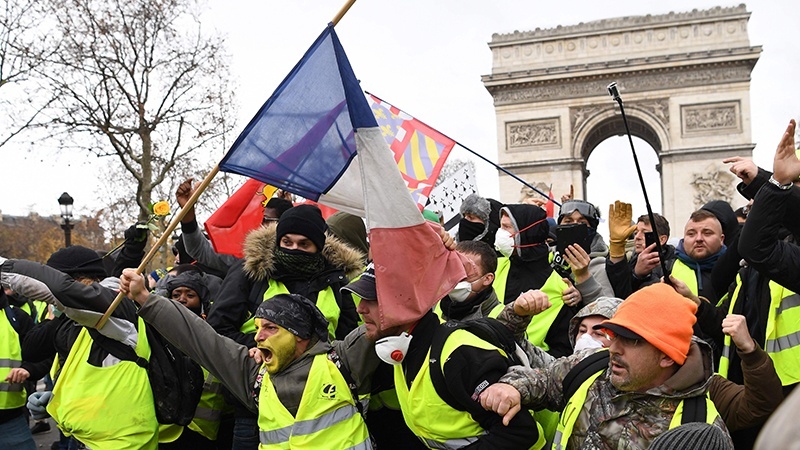 The rallies were organized even after President Emanuel Macron scrapped a planned fuel tax and offered a series of wage and tax concessions in a bid to end protests across the country. “Our organizations support the demands of tax and social justice brought by the movement of yellow vests,” said the organizers in a statement published by French daily Le Parisien. “They call for demonstrations Saturday, December 15, for social justice and tax, for a real democracy, for equal rights, for a true ecological transition,” it added. Similar protests are also expected in other cities across the country. Paris Police Chief Michel Delpuech said they have sent tens of thousands of security forces across the country and some 8,000 only in Paris. The forces are backed up by 14 armored vehicles, water cannon and horses. “We need to be prepared for worst-case scenarios,” he said. Delpuech said security forces are aiming to be in “better control” of the situation than they were last weekend, when some 2000 protesters were detained — around half of them in Paris— and hundred were injured. Six people were also killed. Protests first erupted last month in rural France among citizens who said they could not afford higher fuel taxes. The demonstrations then transformed into a broader rebuke of Macron’s policies, and they took on a name of their own: the “yellow vest” movement, a reference to the vests worn by people active in the transportation industry, who have been at the forefront of the protests. In a bid to end protests, the president cancelled the plan to increase fuel tax and offered a rise in the minimum wage, tax relief for pensioners and tax-free overtime for workers in 2019. His critics, who call him the “President of the Rich,” are still demanding his resignation. Macron took office last year with a pledge to revitalize the economy; but many voters ranging from conservative pensioners to low-income workers complain that his pro-business policies have mostly benefited companies and the rich.